The new SSDs use PCIe Gen3 X4 lanes with AIC & M.2 form factors for high-end storage performance. Freshly launched, AORUS RGB M.2 SSD comes in two mainstream storage capacities: 256GB and 512GB. The SSD delivers sequential read speeds up to 3480MB/s and sequential write speed up to 2000MB/s and is built with anodized, aluminum heatsinks for excellent heat dissipation to prevent heat from being detrimental to storage performance. Freshly launched, AORUS RGB M.2 SSD comes in two mainstream storage capacities: 256GB and 512GB. The SSD delivers sequential read speeds up to 3480MB/s and sequential write speed up to 2000MB/s and is built with anodized, aluminum heatsinks for excellent heat dissipation to prevent heat from being detrimental to storage performance. The hairline finish on the heatsinks offers a clean-cut, elegant look and the AORUS Falcon logo serves as a core part of the design by adding extra texture to the M.2 SSD with its contour and digital LED lighting, complementing AORUS motherboards in a seamless integration of AORUS lighting and style. 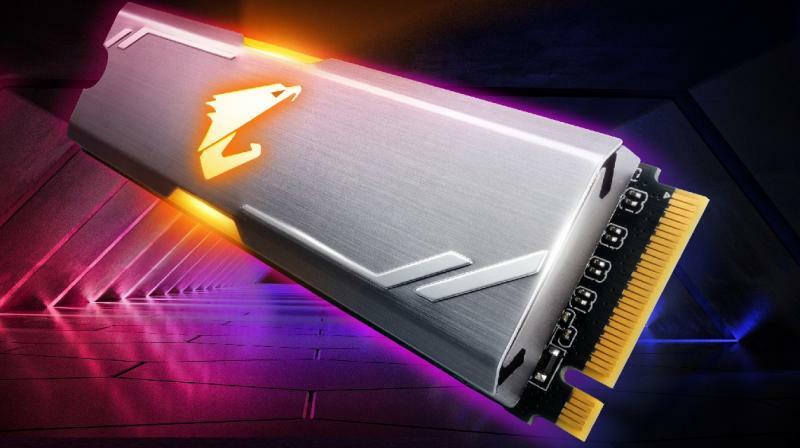 AORUS RGB AIC SSD takes it a step further by offering larger storage capacity sizes 512GB and 1TB as well as faster sequential read speeds up to 3480MB/s and sequential write speeds up to 3080MB/s. The heatsink design of the AORUS RGB AIC SSD draws heavy inspiration from the critically-acclaimed Z390 AORUS Motherboard series, which set many benchmarks in performance with its cutting-edge thermal solution. AORUS RGB AIC SSD carries over many of these heat dissipation technologies and integrates them into its heatsink design to provide a proven thermal solution with superior heat dissipation compared to standard AIC SSD aluminum heatsinks. A 0.5cm thick dark gray aluminum matte heatsink as well as cross cut heatsink for increased heat dissipation area has been added and a thick LAIRD Thermal Pad has been placed between the heatsink and flash memory so that the SSDs can perform at max levels without bottlenecks from excess heat. Excellent balance between performance and aesthetics is a trademark of AORUS design, never compromising performance for style. The AORUS RGB AIC SSD features a heatsink that has been treated with fine sandblasting on the surface and multi-step anodization while utilizing laser engraving for a stylish, clean-cut look. The metallic silver, mirrored AORUS falcon logo further completes the aesthetics on the SSD. AORUS RGB AIC SSD also comes with CNC processed screw holes which look more tidy and symmetrical but most importantly, make positioning more precise for users. Even the most demanding of users will appreciate the attention to detail that AORUS has placed into crafting the AORUS RGB AIC SSD. Furthermore, AORUS RGB AIC SSD offers the best in RGB technology with frontside RGB lighting and default RGB wave patterns so that peripherals won’t get in the way by blocking the view of the SSD lighting effects. To prevent unsmooth or grainy lighting, GIGABYTE has used its experience from developing the AORUS RGB Memory Modules and multi-party verification to further improve the lighting effects of the AORUS RGB AIC SSD. With the RGB Fusion 2.0 App, users can bring smooth or even layered lighting effects to show off new styles of lighting. To provide users with the most reliable and blazing fast read/write performance, GIGABYTE puts the AORUS RGB SSD through rigorous testing while mix and matching them with various GIGABYTE motherboards and different chipsets, as is standard with GIGABYTE products. Clearing testing from test software as well as high temperature and voltage tests, AORUS RGB SSDs meet the standards that users have come to expect from GIGABYTE AORUS products.